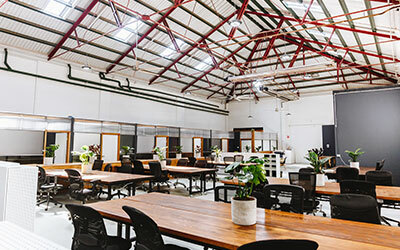 With OzChild operating from 5 premises across Melbourne’s South East, BRM Projects was appointed to investigate the premises and make recommendations for a strategy that focused on the future required size, locations and office resources. Upon investigating, we recommended a ‘Hub and Spoke’ approach, whereby OzChild would condense its footprint to have hubs in Dandenong and Frankston only, rather than expanding its five sites to include a sixth. While the current sites are each 300-400sqm, the new hub will be over 1200sqm, offering provisions for growth and greater efficiency in operation. Many factors were taken into consideration when working with OzChild on this approach. Such factors included: Location, with strong focus placed on the close proximity between clients and carers, staff feedback and considerations relating to requirements and opportunities for improvements and efficiencies, and the layout and functionality of the premises. • A large number of hubs was reducing efficiency for Ozchild, mainly due to location and travel time. Centralising these hubs would mean that staff would be closer to clients and experience an decrease in travel time. 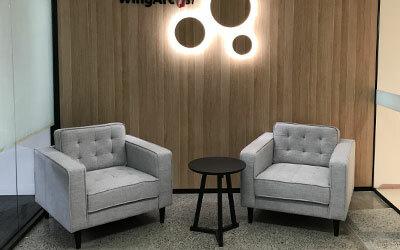 • The new site in Dandenong is not only convenient in terms of its proximity to the other Ozchild offices, but its size also allows for future growth. resources (training rooms, interview meeting rooms, engaging staff lunch areas, outdoor space) and a greater efficiency of space. • In general, the new spaces would be child-centric, with a balance of professionalism and playfulness. Each location would include a warm and welcoming reception and waiting area, a combination of formal meeting spaces, as well as playful informal spaces, a flexible training facility, a mix offices and open plan work areas, an engaging and communal lunch area, as well as outdoor space. 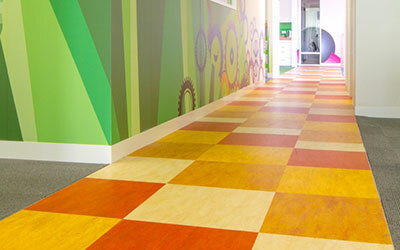 • The design would be sympathetic, understanding and refined, speaking to staff, child, parent and corporate. It should be warm, inspiring and safe. It should also be flexible and dynamic, allowing OzChild to grow, develop and evolve within it.